Want to understand more about RFID? Everything you need to know about RFID, how to choose them and more! 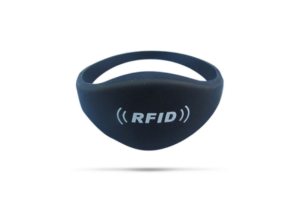 Radio Frequency IDentification (RFID) is an automatic identification (Auto-ID) technology that uses radio waves to identify RFID tagged people, items and objects at close or long range. A fixed or handheld RFID reader that operates at a compatible frequency with the RFID tag emits an electromagnetic wave toward a tag. The radio waves reflected back from the tag are converted into digital information which is then used to uniquely identify a tagged person or object with the help of a computer operated database or other software program. RFID systems can be used to solve an endless range of problems with the speed, accuracy and enhanced security that other Auto-ID technologies such as bar codes really do not offer. What is an RFID Tag Serial Number? RFID tags have a microchip inside with a unique serial number called a UID that is burned into the chip at the factory. The RFID microchip has a small antenna attached to it that allows the chip to transmit information to an RFID tag reader once the chip is read. The UID and/or other information stored on the tag memory are used to uniquely identify a person, item or object. Once identified, a software program running on a computer creates an event for that specific UID, such as allowing a person access to a building or special area or tagging an item from a certain zone or package into inventory. What is the Read Range of a Typical RFID Tag? The read range of an RFID tag depends on the frequency used for the application, the power of the reader, interference from metal objects or other RF devices, line of sight, body shielding and many other factors. The only real way to find out how a tag and reader will react in any special application is to set up a reader and tag on site and test it to see how it behaves. What RFID Tag Frequency Should You Use? 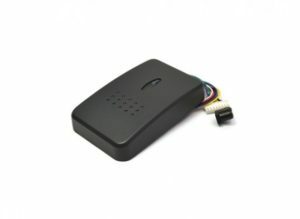 Passive 125 KHz RFID tags do not have a battery to power assist the signal. The power to read a tag comes from the reader, which sends out electromagnetic waves that induce a current in the tag’s antenna. LF tags are usually read at 6-15 cm and are very suitable for applications where you do not want many tags read at one time and where low cost is a factor. The lowest cost tags are the 125 KHz read only tags while other LF tags are available with memory but at a higher price. Typical Applications: Product tracing, access control, livestock tracking, tracking/identifying objects with high metal or water content, authentication. Why choose an LF tag? LF tags are normally the least expensive to use and read at short distances (< 10 cm). 125 KHz LF RFID tags have a slow data transfer rate but are ideal for scanning single objects with high water content such as people, fruit or beverages and can be used in areas with high metal content. LF tags that operate at 134 KHz are typically used for animal tracking applications. Passive high-frequency 13.56 MHz RFID tags can be read from 15-100 cm depending on the power of the reader. Up to 20 HF tags can be read at one time by a reader, which may suit some applications but not others. The cost for an HF tag is usually higher than the LF tags owing to the better read performance, data transfer speed, security features and available memory on the tag. Typical Applications: Event ticketing, transit smart cards, secure stored value/credit, payments, access control, patient management, library book management and asset rental. HF ISO Standards: ISO 15693 is the standard for tracking items. Other HF standards include the ISO/IEC 14443 A and ISO/IEC 14443 standards for MIFARE technology, which is used in bracelets, cards and tags for various types of applications. Why choose an HF tag? 13.56 MHz HF tags can be read using a compatible 13.56 MHz RFID reader. HF tags are ideal for scanning both single objects or up to 20 objects at one time. Data transfer speed is faster than a 125 KHz tag but the read and write distance is still considered short at circa 15 cm-30 cm depending on the reader. For longer read-write distances you need to consider a UHF tag. HF tags are typically more expensive than LF tags but less expensive than UHF Tags. Tag credentials are used in building or event access control, public transportation and electronic payment system applications. HF tags can also work well around metals and liquids. The UHF frequency is regulated by a single global standard called the EPC Global Gen2 (ISO 18000-6C) UHF standard. Europe uses 868 MHz for UHF and the USA uses 915 MHz. It is important to note this difference when ordering tags. Passive UHF tags can normally be read at 3-8 meters, however, passive UHF wristbands tend to read at circa 30 cm due to body shielding. UHF tags are normally more expensive than LF or HF tags so it is important to specify the correct tag for your application to keep costs under control. UHF frequencies typically offer better range and can transfer data faster but use more power and are less likely to pass through materials. They also tend to be more directional and require a clearer path between the tag and reader. Typical Applications: Inventory management, anti-counterfeiting, vehicle access control, parking management, toll collection, warehouse applications. Why choose an UHF tag? UHF tags are better for scanning many boxes of goods at once as they pass through a bay door into a warehouse. Radio waves bounce off metal and are absorbed by water at ultra-high frequencies so they tend to be not so popular for those types of applications but good system design and engineering can overcome this shortcoming of UHF tags. 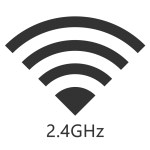 These operate at the 2.4 GHz microwave band and emit a signal from the tag with the use of a battery that runs the microchip circuitry. This boosts read ranges from 1 to 100 or even 1500 meters. Active RFID tags are expensive but solve tracking problems that other tags cannot solve. Typical Applications: Tracking and locating people at long range such as in patient wandering or child security applications. Also suited to long-range asset tracking/locating such as at auto dealerships, manufacturing plants, in hospitals and on construction sites, mining applications, laboratories, remote monitoring and asset security applications. Why choose an Active RFID tag? 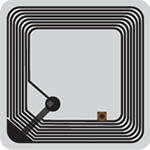 Active RFID Tags are like beacons that are used for asset locating, tracking and security management. The decision to use and active tag normally resides on the read distance needed and the asset value as well as the budget available for the project. 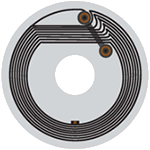 Active RFID tags can range from $5 – 100/pc so these tags are not well suited to applications that rely on low cost. Near-field communication (NFC) is a set of communication protocols that enable two electronic devices, one of which is usually a portable device such as a smartphone, to establish communication and exchange data such as text or numbers when in about 4 cm proximity to each other. Different NFC tags have different amounts of available memory. The memory on an NFC tag can be used store things like a URL (web address) or a telephone number creates an event when read. This information is stored in a specific data format (NDEF – NFC data exchange format) so it can be read by an RFID enabled device or smart phone with NFC reader. As an example, a standard Ultralight NFC tag can store a URL of around 41 characters, whereas the newer NTAG 213 NFC tag can store a URL of around 132 characters. It is important to get the correct amount of memory on the tag as this will influence cost. The number of NFC enabled phone and NFC apps is growing quickly and include apps that allow you to encode tags to turn your phone’s wifi or bluetooth on or off or open up your favorite weather page. You can encode a tag for your office desk and just tap it to change all your phone settings. NFC brings endless possibilities for use in promotional campaigns, marketing and advertising; any place where small bits of data can be used to create an event or perform a task.